Approximately 98% of all eggs purchased in the U.S. come from battery cage hens, and labels such as “Farm Fresh,” “Cage Free” and “All Natural” can be misleading, as they tell you nothing regarding animal welfare, what the animals are fed, or how nutritious (or potentially dangerous!) the eggs are likely to be. And while I am quite aware that organic standards are far from perfect, I do buy organic eggs from the grocery store from time to time, when my local farmer is out—secure in the knowledge that the organic label means they come from happier, healthier hens, right? Apparently, even certified organic eggs can come from hens living in inhumane, factory conditions—making their eggs both a nutritionally and ethically inferior product. The photo below (and at the top) is just one shocking example of conditions that most “organic” chickens must endure, details of which are laid out in a damning report by The Cornucopia Institute called Scrambled Eggs: Separating Factory Farm Egg Production from Authentic Organic Agriculture. The report is the result of two years of research where the Institute visited over 15% of the certified organic egg farms in the United States, and surveyed all name-brand and private-label industry marketers. The report’s findings demonstrated a huge difference between the best-practice husbandry exhibited by many small and medium-sized organic egg and chicken producers, and the bare-minimum standards followed by many industrial-scale operations. “Imagine 80,000 laying hens in a single building, crowded in confinement conditions, on “farms” with hundreds of thousands or a million birds. Is that organic? How about a tiny enclosed concrete porch, accessible by only 3%-5% of the tens of thousands of birds inside a henhouse. Does that pass as outdoor access as required by federal organic law? We have an opportunity to reverse this travesty and support authentic organic agriculture. The USDA’s National Organic Standards Board (NOSB) hears regularly from well-funded and organized industry lobbyists, which is why organic egg standards are so low in the first place! We must ensure that they also hear from people who appreciate real food produced the way it was meant to be. This means you and me! Millions of “cage free, organic” chickens can live inside these types of warehouses. So, if you can’t even trust certified organic eggs (or chicken) anymore, how do you know what kind of eggs are safe, nutritious and humane? The first clue is price. As usual, you get what you pay for. If you buy the cheapest supermarket eggs—even the cheapest organic eggs—you are not only missing out on the valuable nutrients eggs should contain, you are also supporting an industrial production system that treats animals cruelly and makes more sustainable, small-scale egg production difficult. Omega-3 enhanced (or omega-3 fortified) eggs come from hens given feed that contains significant amounts of flaxseed, which is high in omega-3 fatty acids. Most omega-3 enhanced egg layers live out their lives in battery cages. Omega-3 eggs are unregulated, and the amounts of omega-3 fatty acids in eggs can be quite variable. Cage-free is a loose, unregulated term where eggs could be from chickens confined to a barn, or from chickens with access to outdoor space. There is a big difference between the two! Cage-free egg producers are not audited by third-party inspectors, unless they are also certified organic. Many people buy “cage-free” eggs believing that the hens that lay them have access to outdoor pasture, but the reality is that these chickens usually live inside dark sheds. They are free to roam around within the enclosed space and to stretch and spread their wings—which is a significant improvement over battery cage conditions—but they don’t typically have access to outdoor pasture. As with battery cage farming, forced molting (starving hens to produce more eggs) and beak trimming (removal of a portion of the beak, usually with a heated blade) are common practices. Plus these birds can still be given antibiotics, animal byproducts, and food from GMO crops. They may live in overcrowded conditions, and may or may not have access to nests and perches. In other words, they are probably not what you thought they were. 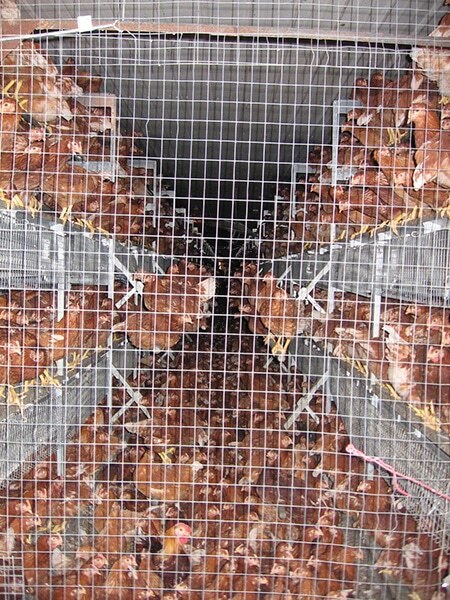 The photo at the top of the article is an example of the conditions that qualify as “cage-free” or “free-range” for both egg-layers and meat birds. Certified organic eggs come from antibiotic- and hormone-free hens that have “access” to outdoor areas and are fed an organic diet, though some beak trimming is allowed. The conditions in which organic eggs are laid are verified by third parties, which reduces the likelihood of fraudulent labeling. 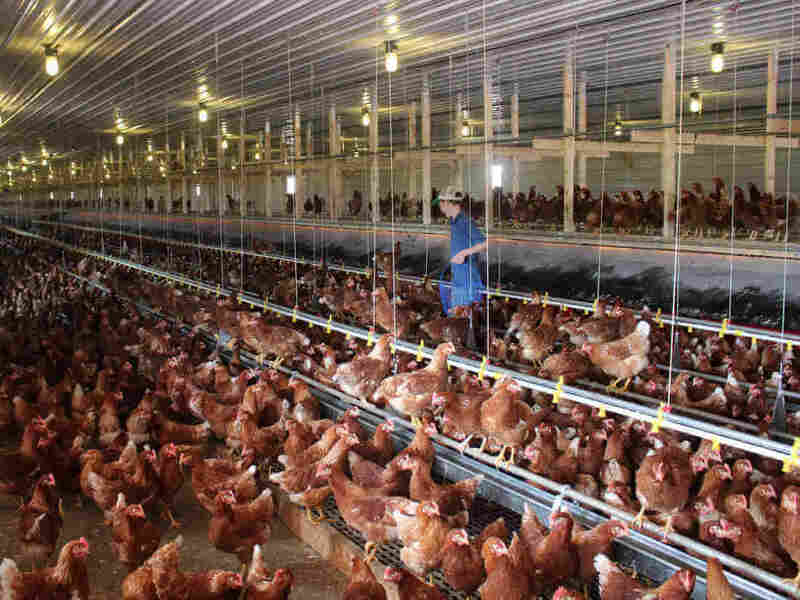 However, until consumers demand stricter standards for organic eggs and chicken, “access to the outdoors” can mean millions of birds crowded into a shed with access to one tiny, concrete-floored porch (like the image above). So it’s a good idea to do a little investigating into your brand of eggs, or use this great Organic Egg Brand Scorecard to help you choose a healthier, more humane egg! True free-range eggs from hens raised on grassy pastures are more nutritious than those obtained from cage-free, confinement operations or battery cages. However, free-range producers are not audited by third parties unless the eggs are also certified organic. The label “Pasture-Raised” is also unregulated and without uniform standards, so, once again, it’s a good idea to do a little investigating or use the Organic Egg Brand Scorecard. 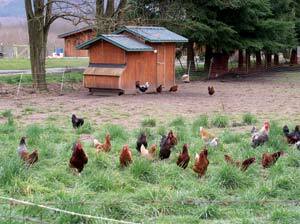 Animal Welfare Approved hens live in cage-free environments with real access to outdoor pasture. They are able to move freely, socialize, and engage in natural, health-promoting behaviors. Beak trimming and forced molting are prohibited. This is a relatively uncommon certification at this time, but with your help, its usage could grow. The helpful infographic at the end of this article visually breaks down which labels mean what. Why Does A Pasture-Raised Egg Matter So Much? Truly pasture-raised hens live like this! If you’ve never eaten an egg from a hen raised on sunshine, bugs and grass, then you are in for quite a treat. Deep orange, gooey yolks stand up tall within their thick, milky whites unlike any store-bought egg you’ve ever seen. Their color, flavor and texture are made distinctive by high amounts of Vitamin A, D, E, K2, B-12, folate, riboflavin, zinc, calcium, beta carotene, choline, and tons of omega 3 fatty acids, including DHA, EPA, ALA, and AA. A pasture-raised egg is a true superfood. Second only to the lactalbumin protein in human mother’s milk, eggs have the highest quality protein of any food. In addition to being an affordable, extremely dense source of nutrition, eggs can be prepared in a variety of tasty ways. This is especially true of a pasture-raised egg. Mother Earth News conducted an egg testing project in 2007, and found that eggs produced by truly free-ranging hens were far superior to those produced by battery cage hens. The study involved 14 flocks across the United States whose eggs were tested by an accredited Portland, Oregon, laboratory. They also found that eggs from hens raised outdoors on pasture have from three to six times more vitamin D than eggs from hens raised in confinement. Pastured hens are exposed to direct sunlight, which their bodies convert to vitamin D and then pass on to their eggs. Eating just two of these eggs will give you from 63-126% of the recommended daily intake of vitamin D! Note that this benefit comes only from hens that are free to graze fresh greens, eat bugs, and bask in the sun. 99% of the eggs sold in the supermarket do not meet this criterion. Even though the label says that the eggs are “certified organic” or come from “cage free” or “free range” hens, or from hens fed an “all-vegetarian” diet (chickens are NOT vegetarians! ), this is no guarantee that the hens had access to the outdoors or pasture—which makes all the difference. Pasture-raised eggs contain 70% more vitamin B12 and 50% more folic acid (British Journal of Nutrition, 1974). Greek pastured eggs contain 13 times more omega-3s than U.S. commercial eggs (Simopoulos, The Omega Diet, 1988). Pasture-raised eggs are higher in vitamin E and omega-3s than those obtained from battery-cage hens (Animal Feed Science and Technology, 1998). Pasture-raised eggs are 10% lower in fat, 34% lower in cholesterol, contain 40% more vitamin A, and are 4 times higher in omega-3s than standard U.S. battery-cage eggs, and pasture-raised chicken meat has 21% less fat, 30% less saturated fat, and 50% more vitamin A than that of caged chickens (Gorski, Pennsylvania State University, 1999). Pasture-raised eggs have three times more omega-3s and are 220% higher in vitamin E and 62% higher in vitamin A than eggs obtained from battery cage hens (Karsten, Pennsylvania State University, 2003). Long and Alterman (2007) attribute the dramatic differences in nutritional content to the fact that pasture-raised hens consume a more natural, omnivorous diet that includes seeds, worms, insects, and green plants, and they get a lot of sunshine. Factory farm birds—both conventional and organic—never get to see the outdoors, let alone get to forage for their natural diet. Instead they are fed the cheapest possible mixture of corn, soy and/or cottonseed meals, with all kinds of additives, often including arsenic. So for the best eggs you can get, look for eggs from “pasture-raised” hens that are only supplementally fed with organic grains. You are most likely to find these superior eggs at farmer’s markets or natural food stores. Better yet, purchase them directly from your local farmer, or raise a few chickens yourself. The benefits of pasture raised eggs can’t be beat! In the end, all of this is just one more reminder that while certifications and labels may be useful tools, there is no substitute for having a real relationship with your local farmer(s) and knowing where your food comes from. Find eggs from pastured hens in your area on Eatwild.com. Your best bet is to find a small scale farmer who raises chickens the way you think they should be raised, and who can sell you very fresh eggs. They should be more than happy to tell you how many days old their eggs are that they are selling. And they should be willing to have you visit them and see how they raise their chickens. Eggs with yolks that thick have so much flavor, you don’t even need to salt them. So sad that the chickens live in such crowded and filthy conditions. Not sure which eggs are truly healthy. 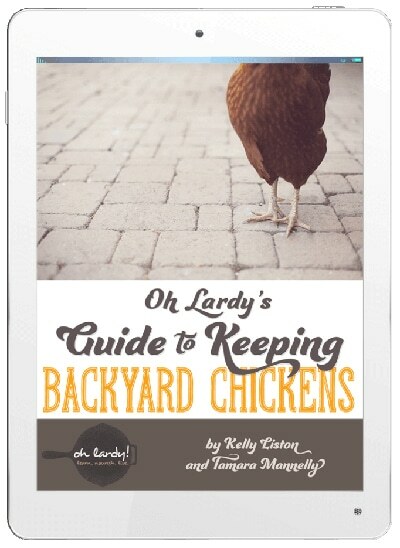 We live in the Bay Area in a typical residential lot and have two hens who have access to the backyard. We get nearly a dozen eggs a week and love them, the eggs and the chickens. Most of the labor was in building the coop. I knew things were bad in the factory farms but I had no idea. Thanks so much for sharing. So glad I have my own happy chickens. I was very interested in reading your website, and you have convinced me to look for and buy eggs that help promote well cared for hens. I do want to let you know, your site is very difficult to read with the current background. It’s pretty, but I nearly navigated away from it because the background is so busy that I couldn’t see the text very well. Thank you for commenting. This only happens on older browsers or very slow internet connections. The blog text is actually on a very large white space with the photo just barely visible around the edges. On the eat wild list there is a ranch listed that says it meats their standards, however, when you click on the Egg Scorecard, that same ranch was only given 1 egg. It’s inconsistent and makes me wonder the validity of this site. On Eatwild.com farmers sign themselves up, and take a pledge to meet certain standards. It’s a free community-built database that works largely by honor system. The have no funding but donations, and a staff of one. But as a community-driven database, if enough people complain about a farm or ranch, Eatwild will remove it. Cornucopia Institute, on the other hand, is a large watchdog organization that had the funding to actually go out and evaluate the farms in person and make their assessments based on their own criteria. Each organization can only do what it’s mission and funding allow it to do. So, in a nutshell, there is no substitute for doing your own due diligence. Call or visit the farm and talk to a real person, and get a feel for the operation yourself. If the farm isn’t as humane as Eatwild requires, let Eatwild know so they can fix their listing. If it is OK to you, maybe they’ve improved since the Scorecard came out, or maybe Cornucopia was too harsh. What matters is that you feel comfortable with what you see. A good operation has nothing to hide and most of what you need to see should be plain as day. Looking forward to expanding my knowledge base. I like the Free Range Organic eggs. I raise my own chickens this way. They live out side and roam all over our property. The only time they get any feed is at night to get them penned yo FOR THE NIGHT. ( we were losing a lot to owls) and rhey are promptly let oily first thing in the morning. I sell my eggs to friends and family. Who love them. Thank you for this! We live in Canada, but I imagine the situation is much the same. I desperately want to raise a few hens for eggs (and because I just adore chickens), but I’m being really careful to do it right- don’t want to have my girls freezing their feathered fannies off in a Newfoundland winter! This information is very useful and thought-provoking. I know a man who used to work on a large industrial chicken farm. He now buys all his eggs from a man who has a small, free range farm with very happy Rhode Island Reds. I raise my own chickens too. In most areas you will be able to find a local person who is selling wonderful eggs. Our local feed store always has beautiful eggs too. i started off with 12 chickens four years ago, in the past year now im up to 130 chickens, everyone around me love my hens eggs, they are pastured raised since they were able to go outside! i cant keep up with the demand of eggs, im sold out almost every week which is a good id say. But there is definitely a big difference between what you can buy from the store and what comes straight from the farm! buy local people thats the best way to know where your food is coming from, and supporting the farmer is always good! Any idea what good brands are available in East TN? None of the ones on the scorecard were in TN. The best source of pasture-raised eggs—no matter where you live—is from a local farmer you know is raising their hens sustainably in the sun and grass. These are the freshest, healthiest eggs of all, and they can often be found at farmer’s markets. You can also check http://www.eatwild.com to see if there is a farm listed near you. Thank you so much for highlighting this worrying trend! I for one am going to be very careful, only to buy pasture raised chicken eggs! Thanks for sharing this with us on Seasonal Celebration- as always you links are most appreciated! This is a great article. I was surprised at most of the information. I thought my nest fresh cage free eggs were okay. I will not be buying them anymore. After going to Cornucopia I found that Vital Eggs Available at Whole Foods are going to be the best eggs available in my area. I will be buying my eggs there from now on. Todays Wednesdays Adorned From Above Link Party is up and running. Everyone is welcome to link and join in the fun. Check out what other great bloggers are up to. Also get this great Natural Lip Balm Recipe. Thanks so much for sharing this on Natural Living Monday! Buying eggs are so confusing. I wish we had a more reliable way to get eggs from the farm but it is so difficult! I will definitely pay more attention to the animal welfare ratings. Thanks so much again! I love all the time and effort you put into your posts. Thanks for explaining this so well!! Thanks so much for clarifying the different labels on the eggs! This is a really worrying issue. Thankfully our rules are stricter in the EU and the worst of the battery cages have been banned altogether. Unfortunately they do still allow ‘enriched’ cages which while they allow for more movement and some natural behaviours are really not ideal. Here, if an egg is labelled ‘free range’ or ‘organic’ it does have to be from hens that are not caged – but you have to be very careful about the labelling. The best way is, as always, to get your eggs from a farmer you know and trust. I don’t eat eggs, but I still want too quality eggs for my family. Great article and I love that graphic. Ugh… poor birds! We try to avoid super market eggs as much as we can these days. Every now and again we end up with a carton from them. I am always trying to scheme up ways to fit a few chickens in our house though for ourselves. Still have yet to find a way. Hate being in city limits…. This is why a pay a ton to buy eggs from a local farmer at the farmer’s market. You do get what you pay for when it comes to food. But it’s money that stays local and is returned later with good health! And aren’t those local eggs just incredible?!?! I love this post. This is the reason why I have raised 3 two day old chicks into now 7 week old red star hens. They have free rain over our front and back yards, and sometimes even our house. 🙂 They are so fun to watch and feed. I can’t wait til they start laying eggs in a few months! In the meantime, I buy Organic Valley Farms eggs (best scored eggs that us San Diegans have access to). Thanks again for this post. I enjoyed reading it and gaining more of sense of pride in the work I’m putting into raising chickens. Can’t beat growing your own and San Diego has some of the best laws in the country for urban and suburban chicken raising. You must be very proud indeed! However, in a pinch, you can get Vital Farms eggs in San Diego at Whole Foods, plus our very own Eben-Haezer Ranch offers pasture-raised, organic eggs as well. We raise both our own egg layer and meat chickens. People look at us funny when we tell them we dont feed them. W dont. They have free range of our 3 acres and do a fine job of eating all the little bugs and garden scraps in the compost pile. They compost the cow poo as well. Our yolks are orange not pale yellow like the store eggs. I always tell people chickens are NOT vegetarians. They are like vultures when we butcher an animal. They fight for the entrails. Chickens love bugs and meaty protein in addition to good greens, not GRAINS. I have been SO confused by all the labels on eggs at the grocery store. Thanks for enlightening me! I know pastured eggs are best, but our family eats SO many eggs that I can’t justify spending upwards of $5 a dozen for pastured eggs. I suppose the next best option is organic. Thanks for your helpful research. I’m bookmarking your page for future reference. I’m also a new follower! Support your local farmers! (the one with ducks on the roof and chickens in the tomato patch !) I know that it’s more of a hassle but most places you don’t need to look too far to find someone selling eggs from ‘wild’ chickens. It’s my understanding that the term “organic” ONLY means that the animal was given food that was produced with out the use of pesticides. THAT IS ALL! All natural is such a foolishly used blanket term that means many things and nothing at the same time. The description of “free range” has people thinking that the chicken is tended to by a little old lady in the backyard, feeding them grain and seed from her apron. If people really want to eat better then they must do “their own homework” and stop relying on packaging or the store clerks to tell them what they want to hear! Go to the websites, as questions, if possible go to the facility but don’t expect some thing for nothing and don’t complain about the prices when you have no idea how expensive it is to grow chickens,pigs or cattle!